Cyrsti's Condo: No Rest for the Wicked? Back home on this Monday trying to rest, recoup and catch up on life after a weekend at the Trans Ohio Symposium. Of course I have tons of ideas to pass along to all of you, but I'm going to try to focus them in a way which makes sense for all of us. I know that idea sounds like a common sense one, unless you know me and how my noggin works. If I had to come up with two words to describe the weekend, I would use Diverse and Inspirational. This year I saw and met more transgender women of color and age than last year. Several times I was immensely inspired by both groups and several transgender men I met. The whole event caused me to rethink many preconceived ideas one builds up from very little personal interaction with others out side of my circle of friends and the internet. Along the way, I will pass along the "best of the best", including meeting by accident "Andy" a ten year old transgender boy. My partner Liz and I first noticed him as we were standing in line for lunch on Saturday. Our only real interest at first was he was wearing a protective "boot" on one foot similar to Liz's. (Helping a broken ankle to mend.) Being off in my own little world like I usually am, I just thought he was the genetic son of one the therapists who attended the Symposium. He wasn't. We watched as this little white kid wearing a railroad hat pulled out a small action doll of color in action figure fatigues. Wow-talk about diverse. As it ended up, Liz and I ended up eating lunch beside Andy and his Mom at lunch. It turns out next year, she is putting Andy into a mainstream public school and is naturally very concerned. During the lunch itself, our keynote speaker was Kye Allums, who you may remember as the first transgender male athlete to play on a major college basketball team. We will have more on his speech later as well as how I plan to change completely my workshop next year. In the meantime, the picture of me above is taken from the third floor student union balcony of The Ohio State University in my knitted top Liz made me. 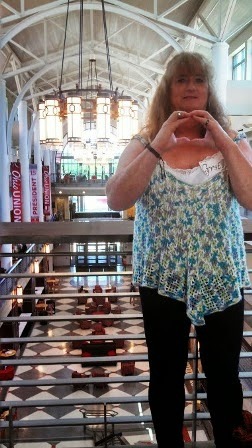 I am making the sign of the "O" saluting the OSU Buckeyes! Go Bux!